Have you ever felt like you should know how to do something that seems universal? I have! And when I don’t know how to do it, I’m often too embarrassed to ask someone else. Sound familiar? Anyone can play the piano once they have a piano in front of them. It’s easy to hit a lot of keys. From toddlers to adults, and even some of our pets, we can all “play” the piano. But how many people can exquisitely play a concerto? How many can evoke the emotions that the composers intended? How many can play difficult pieces and make it look easy? That’s the difference between hitting some keys and really knowing how to play the piano. But, you ask, how does that relate to money? 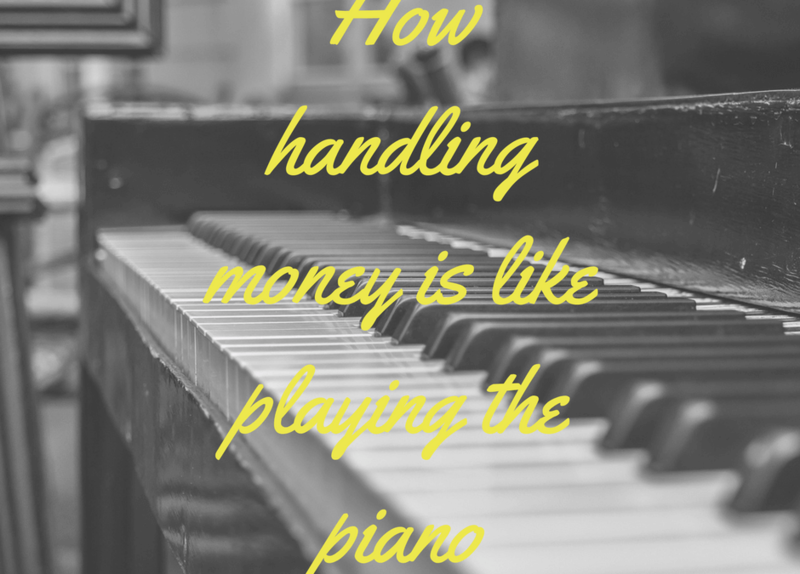 Well, replace “playing piano” with “handling money” in that last section. Anyone can handle money, right? If I gave you $100 right now, you would do something with it. You might put it in your wallet, buy a bunch of chocolate, deposit it in the bank, or use it as the down payment on a new phone. You’d do something with it. Because anyone can handle money. Now, how many people can handle money well? How many people can work a regular job and yet never be in debt? How many people can travel world and retire young? Just like only a select few can play the pianowell, only a select few can handle money well. How can you become one of those few? Because anyone can handle money, and everyone has access to at least a little of it, we all think we should be good at it. That sure would be nice, but it’s just not how things work. None of us are born with an innate knowledge of how to handle money. Just like no one is born knowing how to play the piano. They are both learned. Yes, some people have more of a talent for the piano than others. I don’t know if it’s genetics or exposure or some combination of both. When it comes to money, the lessons we learn at a young age have a big impact. Fortunately, we can learn a lot when we’re older, too! The first step, then, is to stop assuming we should know how to handle money. You probably won’t play a concerto if you’ve never taken a piano lesson and you probably won’t retire at 50 if you’ve never learned good money lessons. So many people feel bad about the fact that they need to learn about managing money. They feel like they’ve failed somehow. But you know better, or else why would you be reading this? You know that it’s important to learn, and you’re ready to do it. That means you’re already setting yourself up for success! Obviously I recommend you read my blog and hire me to work with you. Beyond that, there are thousands of books, blogs, podcasts, videos, radio shows, and more that give you advice on how to handle money. Some of those will be scams and others just give lousy advice, but there are a lot of great ones, too! The ones on my Recommendations page are all fantastic (obviously 😉 ) so I suggest you start with those. After you’ve worked your way through my blog and everything on the Recommendations page, start branching out. Avoid anything that suggests you can “get rick quick.” You can’t. You won’t. Also avoid anything that says it will be “easy” to do. It’s not. It’s not easy, but it’s worth it. Use your judgment and follow basic principles. You have to spendless than you earn. This means cutting expenses and earning more. You need to save a lot of what you earn. You need to have fun. Sometimes that fun costs money and a lot of the time it doesn’t. That’s why you need to prioritize. You need to set goals so that you know what you’re aiming for. Read and listen to advice that includes these basic principles, and you should be on the right track. Most of all, give yourself a chance. We’re not born with some genetically programmed knowledge of how to handle money. It just doesn’t happen. If we’re lucky, we learn it at home or in school. A lot of us don’t. Even worse, a lot of us learn bad money habits that we then have to unlearn as adults. That’s hard, but it can be done. So give yourself a break. 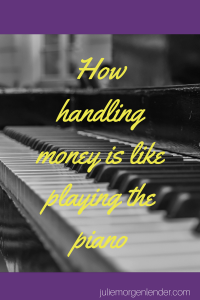 You won’t learn to be a concert pianist after one lesson and you won’t be a money expert after reading one blog post. The great thing is, the more you learn, the more the lessons build on each other, and pretty soon, you will be on your way to handling money well and with confidence! Get started now by signing up below to get weekly money tips right in your inbox. No spam, just Nest Egg Chick tips!